North and South Korea are planning to compete as a unified team at the Tokyo Olympics in 2020 and are bidding to co-host the 2032 Summer Games. Following inter-Korean sports talks Friday the rival nations issued a statement saying they wanted to participate jointly in international competition, starting with a combined team at next year’s men’s handball world championships in Germany. They will send a letter to the International Olympic Committee (IOC), informing the organisation of the two Koreas’ intent to host the Olympics in 14 years’ time. In a statement to CNN Sport, IOC president Thomas Bach said the organisation welcomes plans for a joint bid. Athletes from North and South Korea marched under a unified flag at the opening ceremony of the 2018 Winter Olympics in Pyeongchang, and in ice hockey the women competed as a unified team, helping ease tensions on the peninsular. “After we opened the door for political talks with the joint march of the two Korean teams at the Olympic Winter Games PyeongChang 2018, sport could once more make a contribution to peace on the Korean Peninsula and the world,” Bach said. 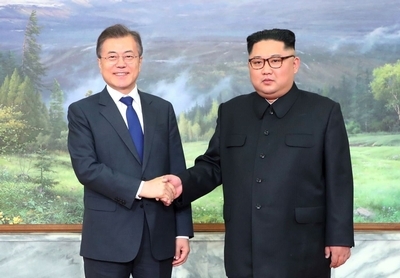 North and South Korea will also “actively participate” in international competitions held in each other’s territories and resolve issues that arise from sports exchanges. Sport has provided many symbolic moments over the last year in the continued rapprochement between two countries still technically at war. In May, North and South Korea were due to play each other in the quarterfinals of table tennis’ world team championships in Sweden, but instead of going head-to-head they came together as a team, going on to lose to Japan in the semifinal.